We originally wanted to be married outside because we both love the natural beauty of northern California. Also, having been brought up with different religious traditions, outside seemed a natural choice. 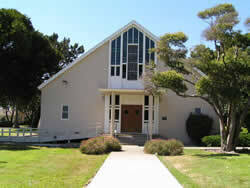 However, Treasure Island in April is bound to be pretty windy, so we opted for the nondenominational Chapel. The Chapel has plenty of parking and pews for our 150-ish guests.